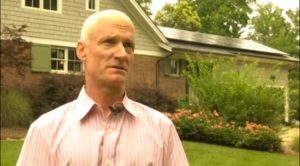 Jim doesn’t shy away from opportunities to speak out as a solar customer living in the heart of Charlotte, NC. His beautiful home features a solar array over the garage, with modules manufactured by an American-headquartered company and rated as among the most efficient available. He’s vocal about what a great deal solar is for homeowners and is in favor of any federal or state policies that make solar even more affordable for residents and business owners. Now that it’s been a few years since his solar was installed, he’s proud to be able to recommend solar to others based on the great results he’s enjoyed and the feeling of taking control of his home’s energy.